When Dionne Warwick signed to the Warner Bros. label in 1971 (bringing her legendary songwriting and production team of Burt Bacharach and Hal David with her), success seemed preordained for probably the greatest pop-soul singer of all time. However, like so many other ‘60s superstars, Dionne fell prey to the changing tastes of the ‘70s marketplace and exited the label five years later sans her production team or any major chart hits. Subsequent anthologies have, understandably, focused on the Scepter label hits she recorded with Bacharach and David during the ‘60s and the more contemporary smashes she recorded for Arista with during the in the late ‘70s and ‘80s, while roundly ignoring her Warner Bros. sides. Now, with this 2-CD set containing with two separate collections of Warwick’s complete Warner Bros. singles and previously unreleased tracks recorded for the label, Real Gone Music is at last shining a light on a body of work that, despite its lack of commercial prowess, ranks as some of the finest this pop-soul diva’s nonpareil career has to offer. The singles collection includes all 21 of the “A” and “B” stereo single sides that Warwick recorded for Warner Brothers featuring such tracks that hit Billboard's Hot 100, R&B and Easy Listening charts as "Once You Hit The Road" and "If We Only Have Love." The rarities package, meanwhile, presents 19 tracks that never came out on LP or as singles, and present Warwick working with such legendary producers as Ashford & Simpson, Thom Bell, Jerry Ragavoy and Holland-Dozier-Holland. 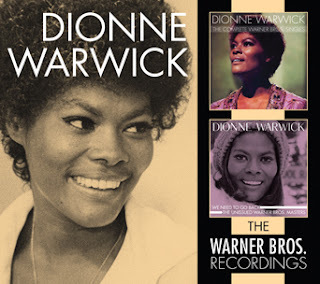 Paul Howes supplies the liner notes to these missing chapters of the Dionne Warwick story! 15. Am I Too Late?